Sleep on fine Merino WOOL- there is nothing better! Enjoy the softness and luxuriousness of this Premium Wool Pillow Soft Cover- for a good sleep all-night; every night. Slide a Queen size pillow into the Cover and your Pillow Soft is ready for use. Pillow Soft covers are good! Really good! You will be amazed at how comforting and soothing they are. The 20" x 30" ( 50 cm x 76cm ) Premium Merino Wool surface creates an ideal sleeping and protective environment. Ideal for users who have abrasions or pressure sore issues in the head region of the body or someone who just wants a better night's sleep. Customers report that they Sleep deeper and longer on a Pillow Soft. The pure wool pile helps to naturally regulate sleeping temperature and allows your face and skin to breathe. Ideal for foam and latex pillows that are too hot. Will prolong the lifespan of your pillow and is fully machine washable. Pillow Soft Covers are made exclusively for Down-Under Wool by MiniJumbuk Australia. 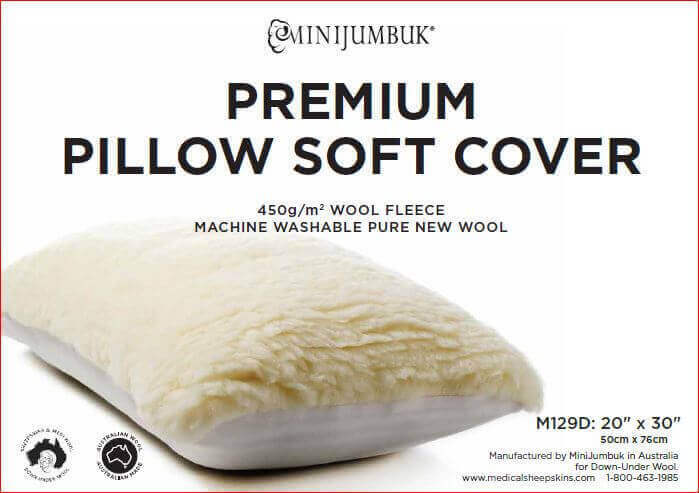 MiniJumbuk is the leading wool bedding manufacturer in Australia. Machine washable in Woolskin. For best care. use a Wool Cycle or Gentle Cycle. May be dried in the dryer using low heat and gentle agitation. Do not overdry.- wool does best with 15% residual moisture.